This is the second part of my yoga poses specifically useful for chronic back pain, in particular, lower back pain. Whilst the 1st post, which you can read here, was mainly, let’s say more gentle asanas, in this post I want to look at some more progressive and slightly harder poses. Obviously, it would be of an advantage to warm up before trying these exercises and it wouldn’t be a bad thing if you did part 1 in order to achieve this, however, any stretches you know that will get your back moving would be fine also. Again this list is not is any particular order and I have included a some media assistance to help you perform the pose, either a clip showing the different stages of the stretch, a picture or both where possible. Whilst this pose is not specifically designed to treat a backache, it is extremely useful in stretching out your hip rotators and hip flexors. Those of you suffering from any type of back pain, chronic or acute tight hips can be a massive contributing factor to back pain. Description: As always try and hold this position for 5 to 10 breaths and repeat if needed. So starting in a downward-facing dog bring your feet together. Drawing your left knee forward and turning it out to the left, your left leg should be bent and near-perpendicular to your right one. Then after this lower both legs to the ground. From here, you can simply keep your back right leg extended straight behind you, or for an added hamstring stretch (not recommended when first trying out the pigeon pose) slowly pull your back foot off the ground and in toward your back. Be careful here to keep your spine neutral and obviously repeat with the other leg. This pose is named after the bird as it looks like when the woodpecker is hunting for food. This is an excellent move to strengthen the muscles in your bottom and in your back. Description: Starting from a lunge position, pressing through the front of your heel stand nice and tall. Then lifting the back heel off the ground your arms should reach out in front of the heart centre. Pushing your bottom out as far as you can whilst keeping the knee static, you should start to feel a stretch in your hamstring at the back of the leg. At this point, your arms may move forward slightly to counterbalance which is fine. Lastly with tension in your core muscles and making sure your spine is neutral slowly lift your arms over your head. As usual hold the pose for 5-10 breaths and repeat on the other side. Please note that if you find the full woodpecker too tough, try keeping your arms behind you in a modified version. You can then develop your strength in this position before moving onto the full version. In all of these types of yoga poses that will help people suffering from back problems, we are trying to engage the back whilst opening up and stretching various other parts of the body. In this pose the abdominal muscles are stretched whilst engaging the back, the chest will open up, a perfect combination! Description: Lying flat on the floor, with your palms facing down by the centre of the ribcage, you draw your legs together. From here press the tops of your feet into the floor and use the muscles of your back (not your hands) to lift your chest off the mat. Leave your legs extended straight out at first. Again hold the position for 5 to 10 breaths, and repeat as needed. Two-Knee Twist – a simple move, done by lying on your back and bending your knees into your chest. Bringing your arms out in a T-position, as you exhale lower your knees to ground on the right, hold for 5-10 breaths and swap over. Sphinx – lying on your stomach, prop yourself up on your forearms. Align your elbows directly under your shoulders and press firmly through your palms and the tops of your feet. From this position press your pubic bone forward. You will feel sensations in your lower back but if it pinches don’t push forward too much. Again hold for 5-10 breaths. Thanks again to my yoga teacher, Eric, for showing us this stretch. Legs Up the Wall – another lovely stretch to do before or after your yoga back routine – push your bottom all the way into the wall and swing your feet up it. This will relax the muscles of the lower back and drain any stagnant fluid from the feet and ankles. As always hold for 5-10 breaths. 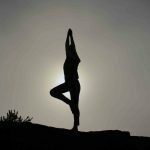 I hope you found this post and part 1 useful and I hope you have given the poses a try and felt some lovely stretches and felt some pain relief, if not for a short time afterwards. Please leave me a comment about this article or any yoga concern you have below, I guarantee I will reply to you. Thank you as ever for taking the time to read this article, I have lots more information on my site, such as; The Healing Power of Yoga, Treat Chronic Back Pain With Yoga and Which Type of Yoga is Best for Me so please have a look at those.